« Welcome to the Last Sock Hop! It’s a Final Farewell to the Be-Bop-A Blog Hop WEDNESDAY, Daddy-O! Now that we've all had a few days to "get our feet wet" with 2012, it's time to start planning how this year is going to be better than the last. That's right...RESOLUTIONS! I don't know about you, but there's one resolution I am bound and determined to keep and that's winning the battle of the bulge against my last ten pounds. I'm sure if I thought long and not too hard about it, I could think of a jillion other things that could call for a resolution, but for my sanity's sake, I'm sticking to the one that will make me the happiest...saying goodbye to those pesky 10 pounds! Tropicana Trop50 has set out to help you stick to those health and fitness resolutions too with their line of Trop50 juice beverages. Keep reading to learn more! They always say that if you actually confess your goals and resolutions to others, they are more likely to come true. Well, with the new Trop50 True Resolutions Facebook App, you can share your secret motivation and earn some awesome incentives. Just for participating, you’ll earn a coupon for $1 off Trop50 for yourself and $0.50 off coupons for up to 50 of your friends. You can even submit incognito with a fierce disguise, but whether you submit a resolution or not, you can still enter their sweepstakes to win a $1,000 gift. If you're like me and are watching your waistline in the new year, then Tropicana Trop50 Juice Beverage might be just what you need for plenty of great fruit taste with few calories. Trop50 is a breakthrough innovation from Tropicana delivering the goodness of fruit juice with 50 percent less sugar and calories and no artificial sweeteners. All Trop50 varieties have 50 calories in an 8-ounce glass, offer a full day's supply of vitamin C and are a good source of antioxidant vitamin E. The 0-calorie, all-natural stevia-based sweetener in Trop50 is PureVia. PureVia is the highest quality extract of the stevia plant called Reb A. In Trop50, PureVia enhances the sweetness of real fruit juice, naturally. So, join me in sharing your 2012 New Year's Resolutions and drink to your health with the new Tropicana Trop50 Juice Beverages! 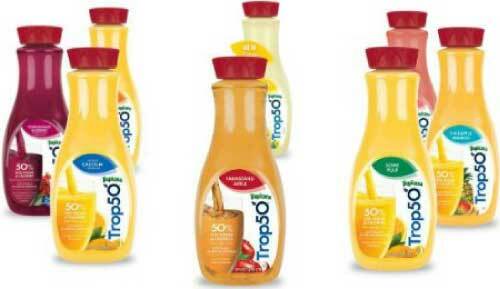 Disclosure: I received a sample of Trop50 from Tropicana in order to facilitate my review. No other compensation was received. This product review is based on my own personal experiences with this item and is completely honest and objective.